A few kilometers from Dunkirk, the refugee camp Grande-Synthe, also called “La Linière,” opened in March 2016. We went to the camp to work to give refugees access to information, just as we were able to do in Greece with the Ideas Box. 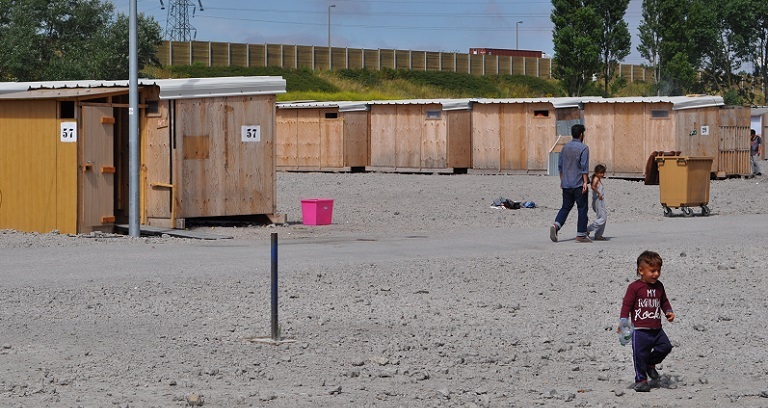 La Linière is the first camp to be constructed according to humanitarian standards in France, and the diverse group of workers there are ready to respond to the needs of the camp’s residents. But in this constantly changing space, how can one find them? Maps are a precious source of information for everyone living and working in the camp. It is with this idea in mind that we teamed up with the volunteer organization Mapfugees for two weeks to implement a participatory cartography program at the camp. The goal? To create a detailed and multilingual map of the camp and the surrounding area with the help of the refugees, in order to improve their access to humanitarian aid and services, as well as their general comfort. To make maps that meet the refugees’ needs, it was essential to include the refugees in the cartography workshops. Admitting that he was tired of these dangerous crossings every night, he decided to stop for a while and involve himself in the life at La Linière. A former humanitarian worker in Iraq, today he works as a very active volunteer alongside the other camp associates. “What do I think about the maps? They’re a good idea. They’re useful for the refugees and the volunteers.” He responded after displaying the finalized maps in one of the camp’s information centers. After this positive experience, we continue to invest ourselves in Grande-Synthe where we are planning to deploy an Ideas Box to facilitate access to education, information, and culture to those in the camp. To learn more about Mapfugees, click here.